It's hard to tell, since you most likely only know me in blog form, but I'm actually kind of shy. Or awkward. Maybe both. I've been trying really hard to get myself out there more. I really do love fashion and the social side of it and sitting on a computer can only take you so far! Luckily, there have been some fun events happening in Seattle that have gotten me off my seat and out socializing with real, live humans! At the beginning of the month, I went to the community night held at the Seattle Art Museum to celebrate the final days of the Future Beauty exhibit. The exhibit featured the incredible works of Japanese fashion designers, such as Junya Watanabe, Issey Miyake, and Commes des Garcons. The museum also hosted a special fashion show featuring the works of teachers and students from the New York Fashion Academy. I went specifically to see my friend Camille debut her amazing designs from her line Millie Vixen. Taking inspiration from both Japanese design and Japanese folklore, Camille created dresses that are as beautiful as they are creepy! 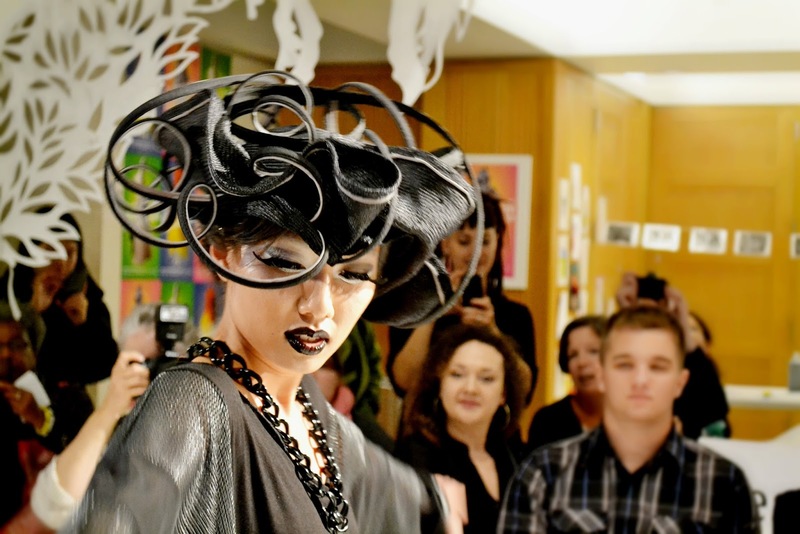 Candace Cantaloupe designs both clothes and fabulous headpieces! 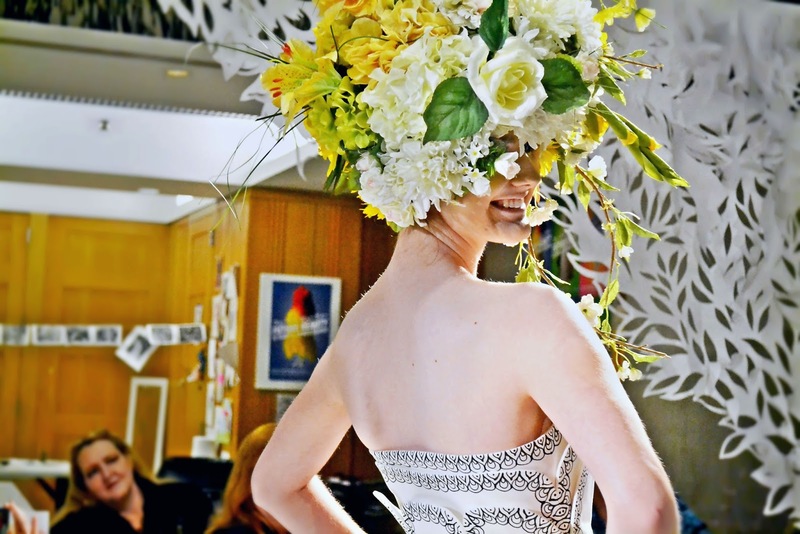 Kristie Metcalf's designs were quite possibly the most wearable of all the creations. If you've ever been to any sort of fashion show, you'll know the feeling; when something just clicks and you can see yourself wearing it in real life. The clothes are not just beautiful, but also achievable! It's no wonder she's been chosen to compete on the Style Network's new show Styled to Rock. This dress had been abandoned at the school by a former student. The academy's director, Terry Horlamus rescued it. I think it was my favorite of the night. 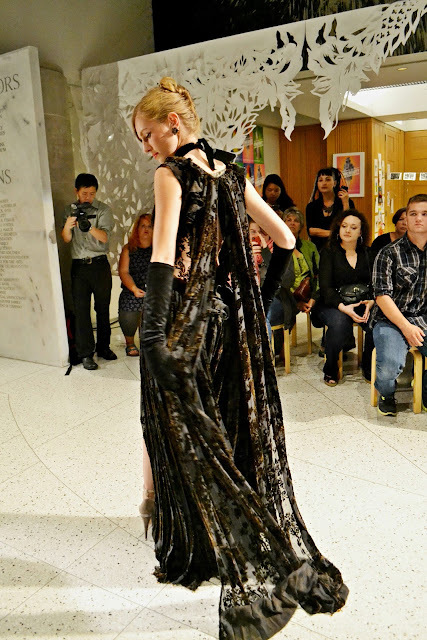 Model Marisa Rocket killed it in this gown by Erin Roby. I was just floored by the detailing in these dresses by Rachel Farquharson. They were all absolutely perfect and stunningly gorgeous. Her final dress had something like 12 different colors of tulle! What a cool event! I wish I'd been there!